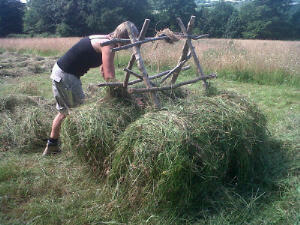 As promised, here is a guide to how we stack our hay racks! Racks are used to save hay from bad weather when is not yet dry enough to bring into a barn. The design of the rack allows the hay to continue curing while the outside layers of hay shed the rain and protect the rest from damage. 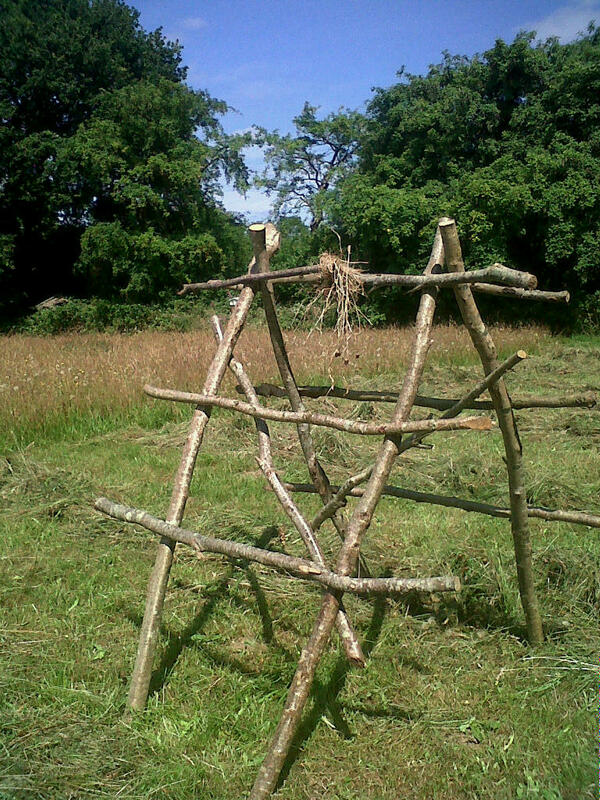 We start with a wooden frame, made from poles harvested from the hedgerows during the winter. The frame is in two parts, rather like two wooden hurdles, with two uprights, three horizontal rails and a diagonal bracing piece. These are leant against each other to form an A-frame as in the picture. We often tie them at the top with a twist of hay or a bit of baler twine to make them more stable during stacking. 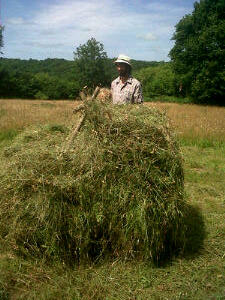 Hay is then raked from the surrounding windrows to the bottom of the rack and we are ready to build! 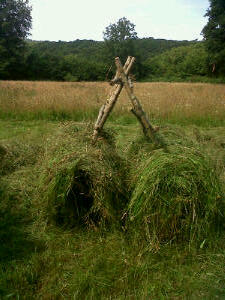 Stacking starts by placing hay over the bottom rail. I tend to put on fairly small amounts at a time, aiming to get the length of the stalks in the hay mostly aligned at 90 degrees to the rail and hanging down either side. It is tempting to put on great armfuls at a time, but this tends to mean the hay is laying in lots of different directions rather then mostly in one direction. A better result is achieved by being a bit more careful and it is not much slower when you are practised at it. Also, there is nothing more annoying if a whole side falls off just as you are about to finish off the top! The layer on the bottom rails is built up, keeping the outside edge pretty much vertical until the second rail is reached. It is tempting at this point to pack down the hay and tuck a lot under the second rail, but this is not generally a good idea unless the hay you are stacking is virtually dry. Compacting the hay prevents air circulation and may cause molding. The wetter the hay is when you are stacking it, the more loosely it needs to be placed onto the rack. Also I have found that as the hay settles naturally on the rack, air channels form under the rails as the hay settles away from them. These potentially aid air circulation through, and therefore drying of, the hay. Compacting it at this stage will prevent this process from occurring. Hay continues to be added to the rack, building up from the second to the third rail and continuing to keep the sides nearly vertical. I tend to build up both sides at the same rate, building up to the second rail, then up to the top. When working with someone else we both take a side and try to build at a fairly even rate. Once the top rail is reached building continues slightly differently. I now place the hay so that it stretches right across the top from one side to the other. Once I have put on sufficient to reach the top of the uprights of the frame, I start working in a circle, walking round the growing haystack and placing hay from all sides as I go. I start to bring the edges in and I am aiming to create a nice rounded top that will shed water effectively. This is a bit of an art and rather enjoyable. Each rack comes out with it’s own unique shape! It is important to make sure enough hay is put onto this top layer, such that there is sufficient to keep the frame covered as it settles. In the past, we have had problems with the uprights starting to stick through the top of the hay as it settles when too little has been placed on top. This then creates a place where water can run into the hay stack and spoil the hay. To finish off, the outside of the stack can be gently brushed to align the stalks downwards and form a better water-shedding layer, although I do not generally find this necessary if the stack has been built carefully. The bottom of the rack often needs a bit of tidying up, with any hay that is lying on or hanging down right to the ground pulled off and put on the top. The racks are amazingly resilient to weather. 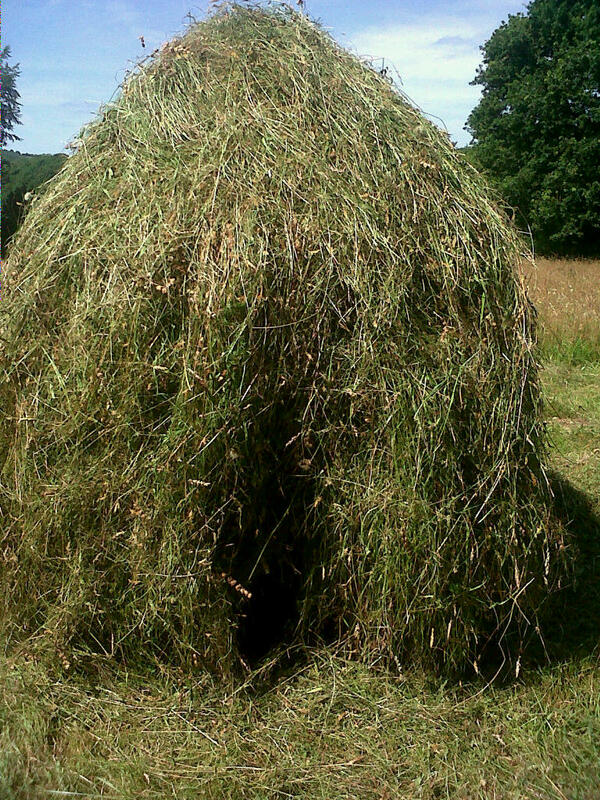 Sometimes the very top layer will blow off when they are fresh, but once they have settled for a few days very little hay seems to blow off under normal circumstances. This year, we have experimented with putting canvas “hats” on some of our racks, as can be seen here. Building up hay from the first to second rail. Note the outside edge is kept nearly vertical. The finished rack. Note curving top to shed rain and the hole through underneath for ventilation.